This awakened replica measures 43 1/4 in. overall, and features a two tone black and silver 25 in. stainless steel blade. The distinctive hilt is wrapped with black cord and accented with gold-colored menuki and brass guard with red cord tied around it. The end of the hilt is further decorated with a pagoda-shaped finial with red tassel. 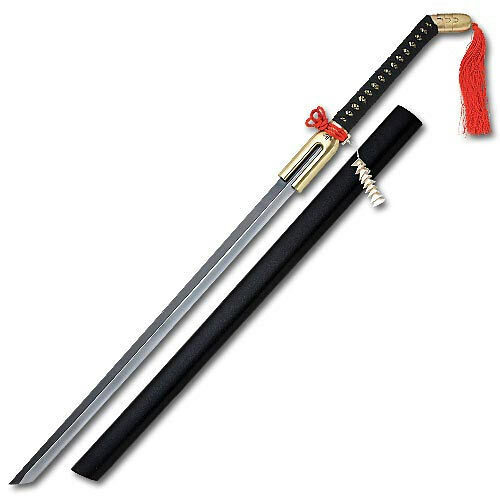 This sword includes a black scabbard and high quality construction throughout. Very nice sword to buy, it's heavy and is going to look great on the wall. OMG me and my son watch bleach and i decided to get this sword for him, but what the hey! i fell in love with it! its truly a grand sword and great show...but my son was upset that i didn't get it for him...ever my daughter COO was jealous! I got it Friday after ordering it late night Tuesday. It is awesome and pretty much what everyone else says. The only drawback is it gets stuck a little in the scabbard. No big deal because it takes a slight jerk and its out. All in all worth every penny. Benihime is my first sword, I ordered her friday and she came in wednesday morning. So far my problem is getting her out the sheath. Many have mentioned that she doesn't fit properly, now I see why. The decorative tassel and pyramids are just as expected and don't get in the way too much. Benihime is a must have for any sword collection and worth truesword's price. I simply love this sword! Urahara is one of favorites in the Bleach series and he would be proud of this sword. A great buy for a great sword! This weapon is a great piece to add to your collection. This weapons hilt is what stands out the most about this sword. It is a very long and strong and is the base of this sword.